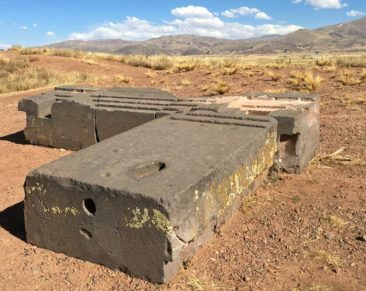 Bolivia first appeared on our radar a couple of years ago thanks to Adam’s love of the History Channel. 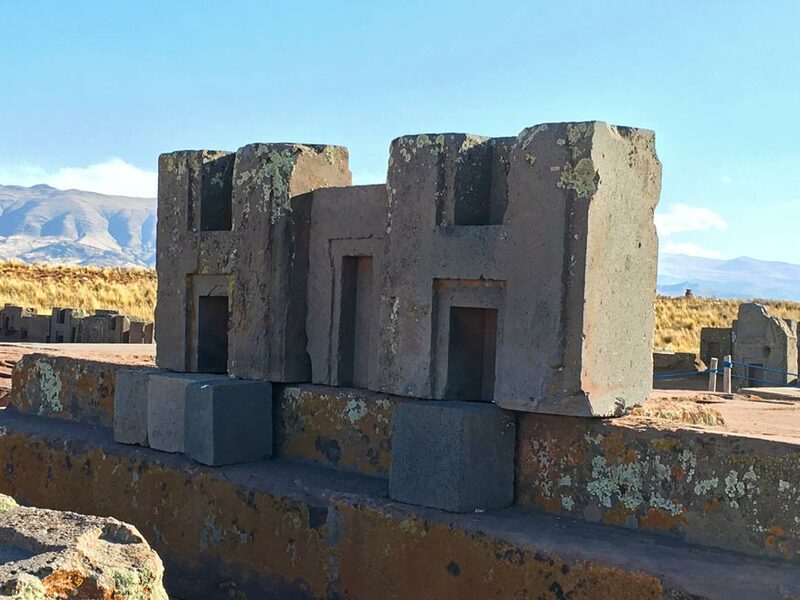 It was the H blocks that captured his attention, with their incredibly precise cuts and edges that seem to defy logic given the tools the pre-Incan people would have had. 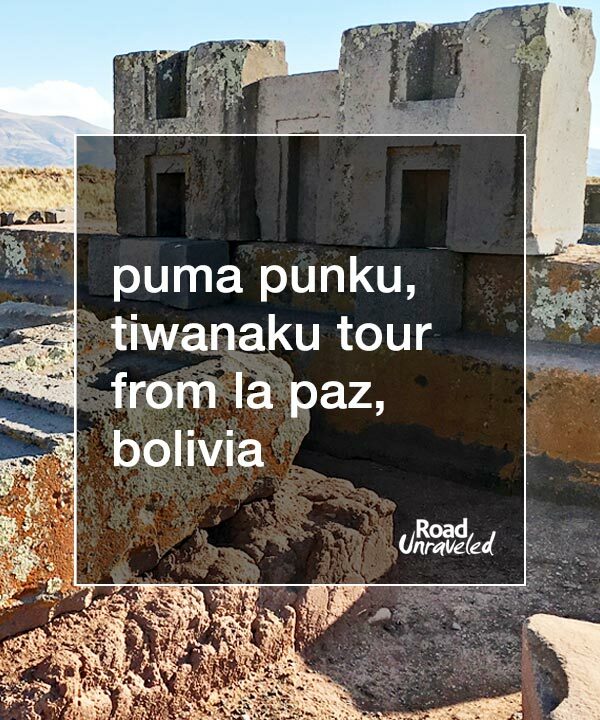 That’s how we first learned about Puma Punku and neighboring Tiwanaku, and when we decided to make the trip to Machu Picchu we couldn’t pass up the chance to cross the border into Bolivia to visit such an intriguing place. 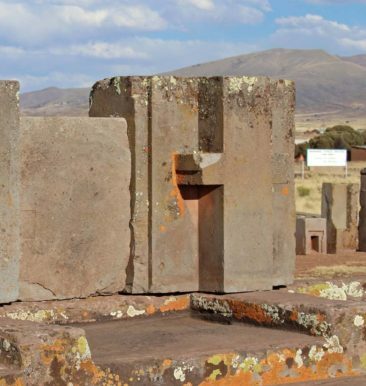 Surprisingly, Tiwanaku and Puma Punku tourism isn’t a booming industry. 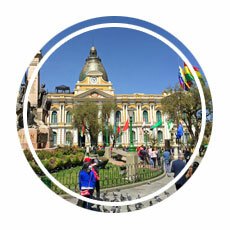 I would have guessed it would be among the most popular places to see in Bolivia, but Tripadvisor’s ranking of top things to do in the country has it barely cracking the top twenty. 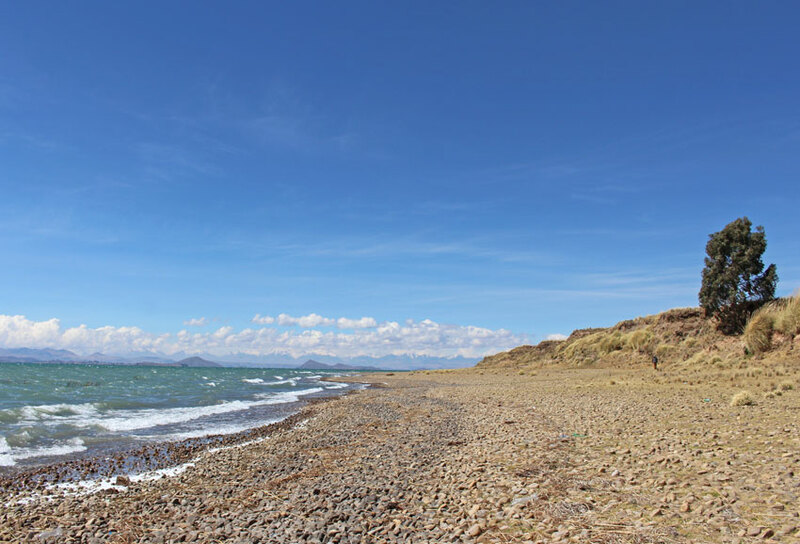 Finding a safe and reputable tour was a bit challenging, but we reserved one that would also take us to nearby Lake Titicaca. We were excited for a relaxing bonus stop! 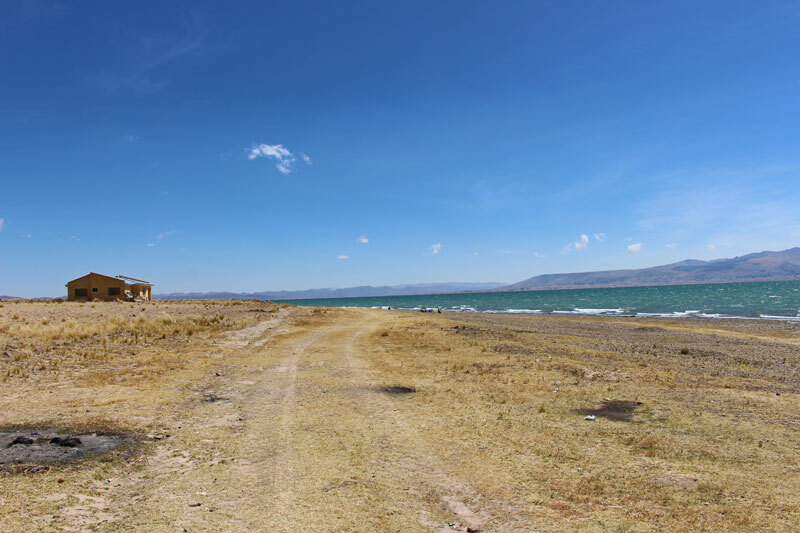 Once our guide arrived we settled into a van for the lengthy drive to Lake Titicaca. 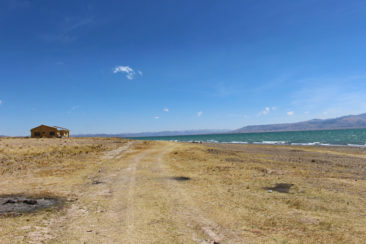 Although the lake is only about 70 kilometers (45 miles) from La Paz, with heavy, unpredictable traffic the journey took close to two hours. By the time we arrived it was already close to lunchtime. We spent about an hour eating a meal our guide packed for us and taking pictures of the lake. 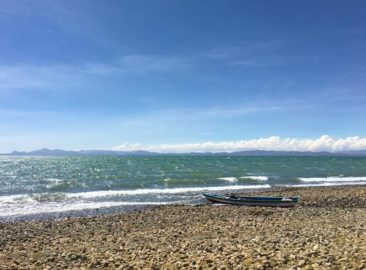 Lake Titicaca is commonly recognized as the highest navigable lake in the world (there are many other lakes that are at higher elevations). 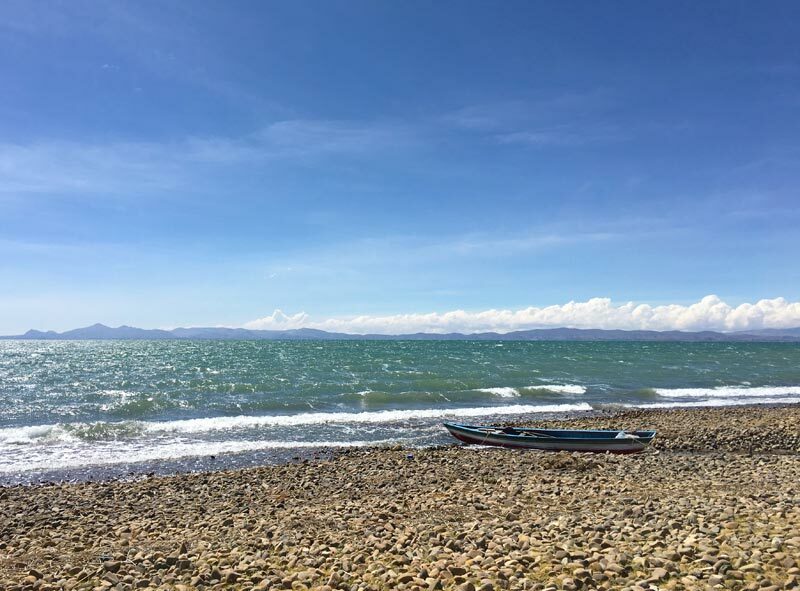 At 12,500 feet, it is big enough for large boats to sail across it. The lake is bordered by both Bolivia and Peru, and from where we stood we could see Puno in Peru, a common place for travellers to stop and spend time as they travel between Cusco and La Paz. After lunch we visited a different section of the lake, this time spending about an hour walking and watching as the waves lapped the rocky beach. 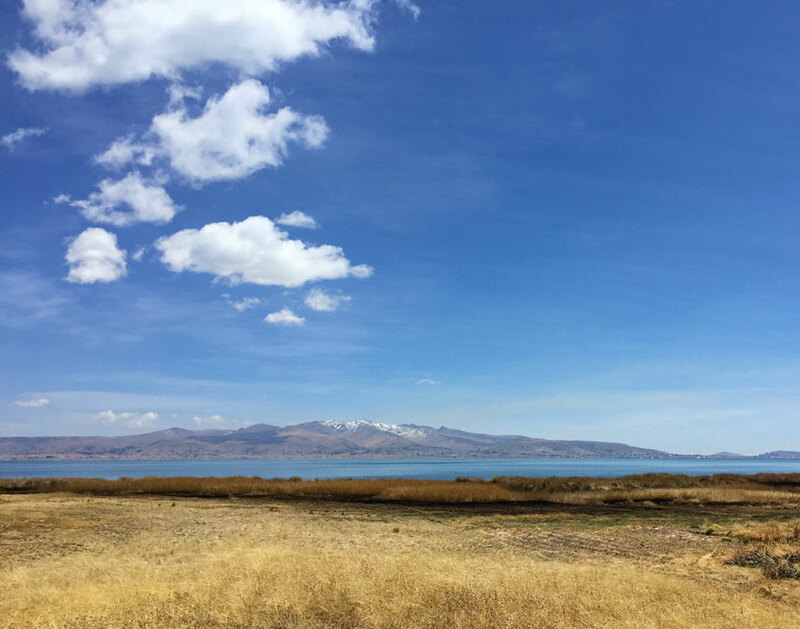 It was a nice respite from the crowds and noise of La Paz, and I was grateful it came on a day where Adam and I were both feeling good with no ill effects from altitude sickness or exhaustion from a week of fast-paced travel. After spending a long time at Lake Titicaca, it was late in the day when we finally arrived at our main attraction: Tiwanaku and Puma Punku. 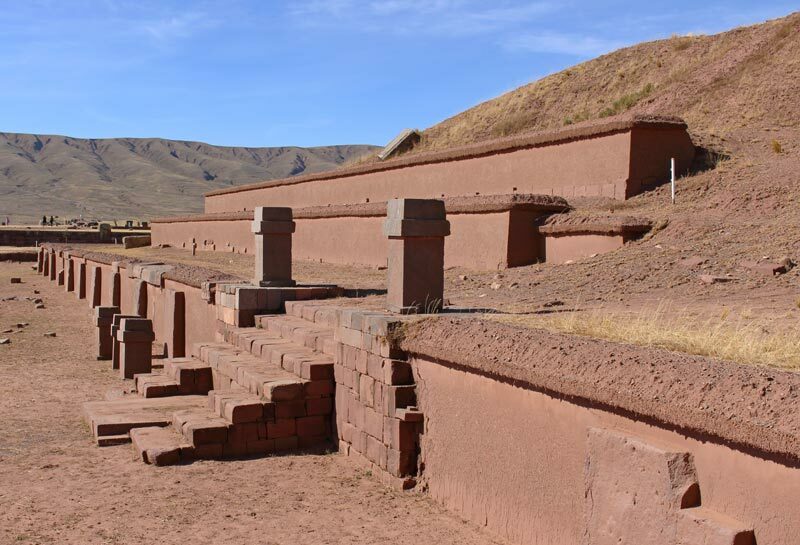 We started at Tiwanaku (also spelled Tiahuanaco or Tiahuanacu), where about 40,000 inhabitants lived in what was one of the largest native American civilizations in documented history. Tiwanaku disappeared before the Spanish arrived (it was abandoned around 1100 AD), and all that remains today are some incredible architectural achievements and plenty of questions. 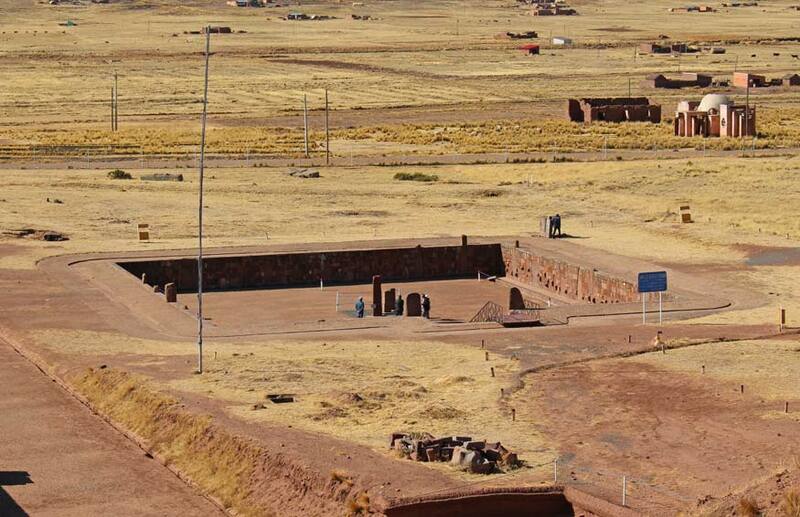 Tiwanaku was likely a religious pilgrimage site, possibly used as a place of worship. 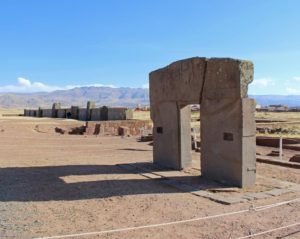 It is younger than Puma Punku, which has led to some theories that Tiwanaku’s location was selected because of its proximity to Puma Punku. 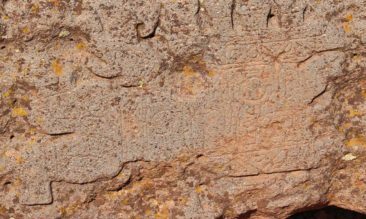 For the most part, the site is poorly preserved. 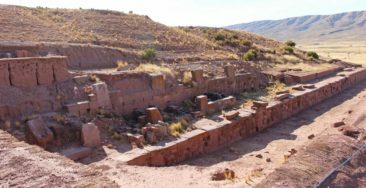 It was heavily looted before it was abandoned and left to erode, and preservation efforts have been limited. 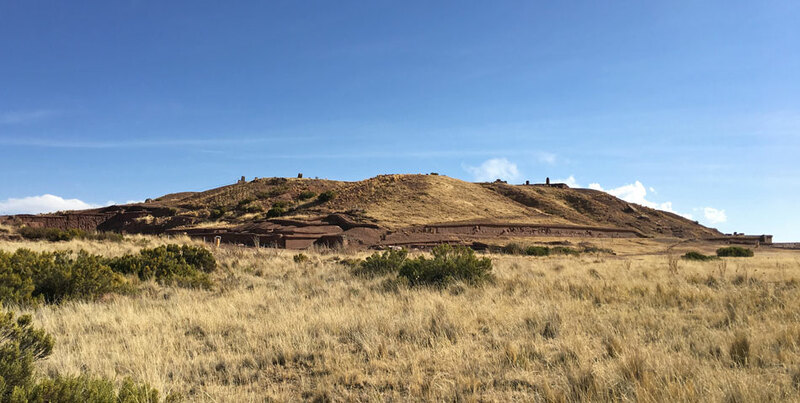 Our guide shared that the Bolivian government requires anyone actively working on ancient sites to have a Ph.D., This means masters or Ph.D. candidates are prohibited from playing an active role in any restoration efforts. 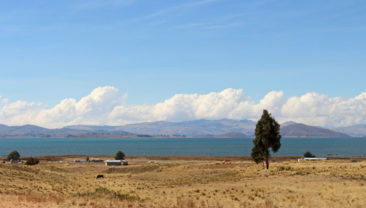 Because there aren’t a lot of people holding Ph.Ds who also want to work in Bolivia and handle tasks typically delegated to students, efforts move very slowly. Additionally, in 2005 UNESCO threatened to remove Tiwanaku’s status as a World Heritage site because the government approved the use of adobe (clay bricks) in restoration work for decorative purposes. 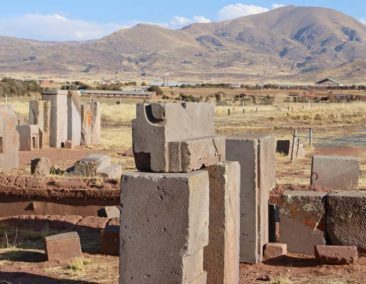 Adobe was not used at Tiwanaku; they used stone in their construction, so to use any other material would compromise the historical integrity of the entire complex—especially just to give the place a makeover. 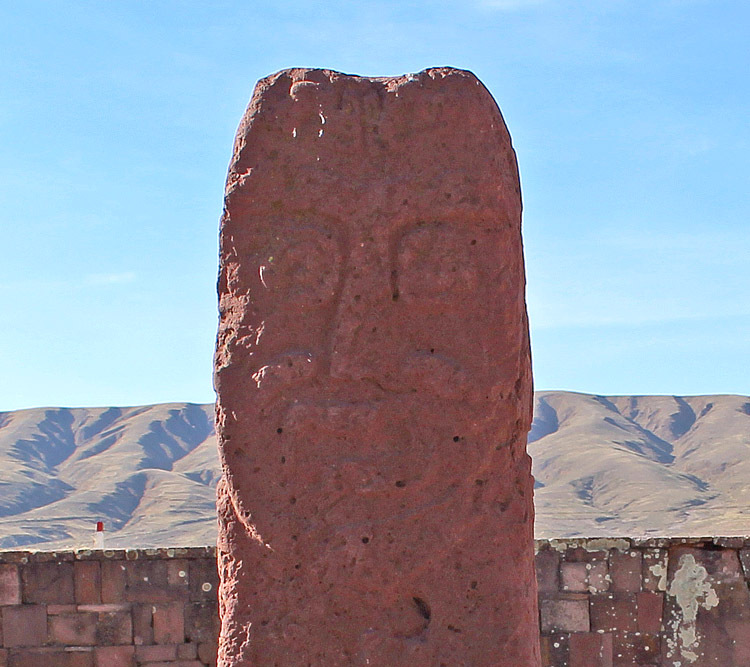 It doesn’t take a lot of time to walk through Tiwanaku, but there is a lot to see. 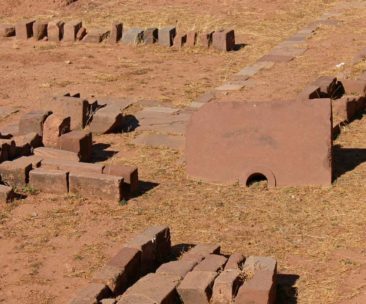 Kalasasaya, a subterranean temple, was excavated in the 1960s, and its entire perimeter is dotted with small stone heads that Adam and I spent a great deal of time examining and comparing. 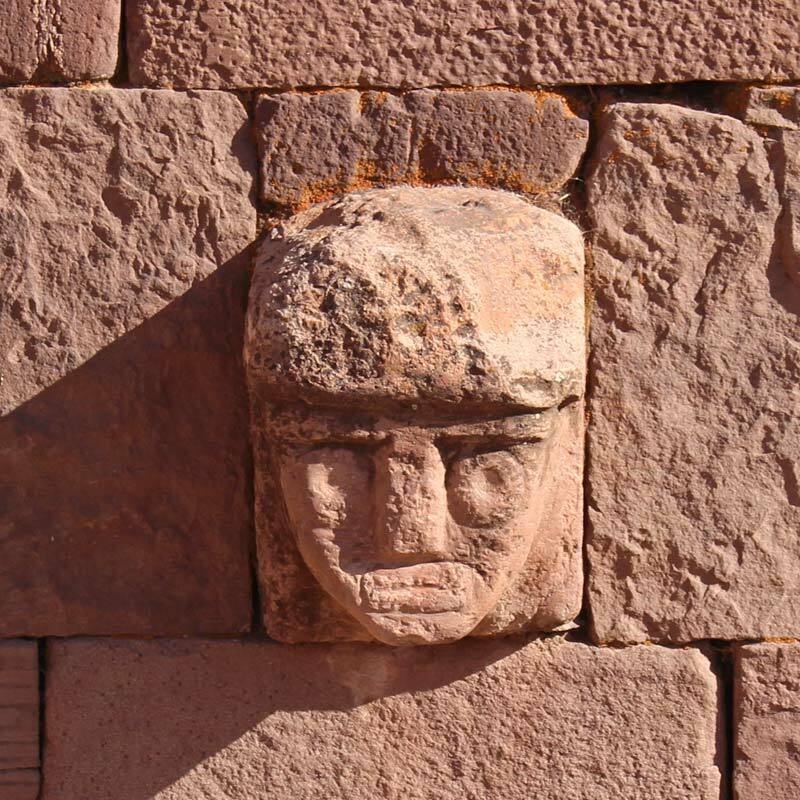 The tiny faces are all unique; they look like they might represent more people than just Incans or even those local to the area. They each boasted distinguishing facial features, including some that seemed to sport turbans and one that looked a bit like an alien. 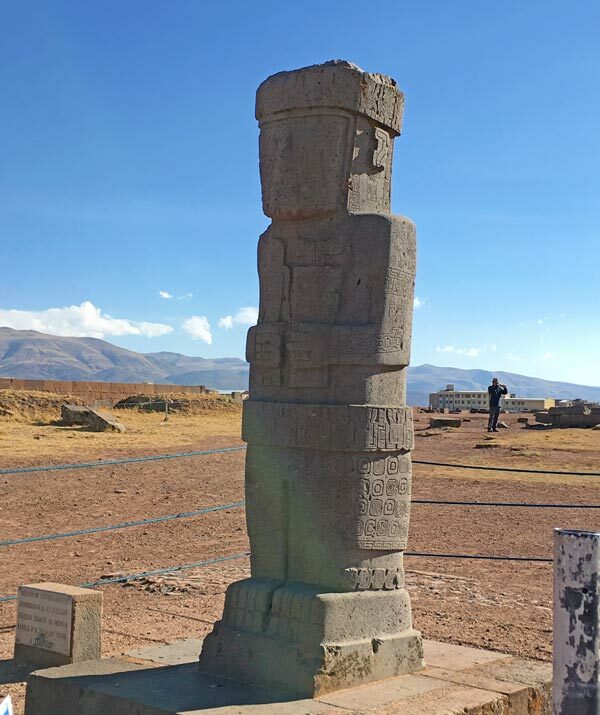 At Kalasasaya’s center is a statue that stands in the middle of the temple, which is believed to be Incan creator god Viracocha. 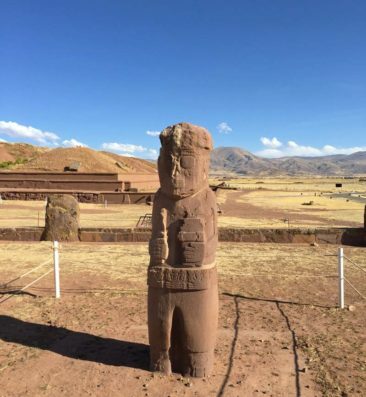 Although researchers aren’t fully committed to the idea that the statue is Viracocha, it is clear the statue is of someone with a beard and mustache, which is fascinating because very few tribal people during that time had facial hair. 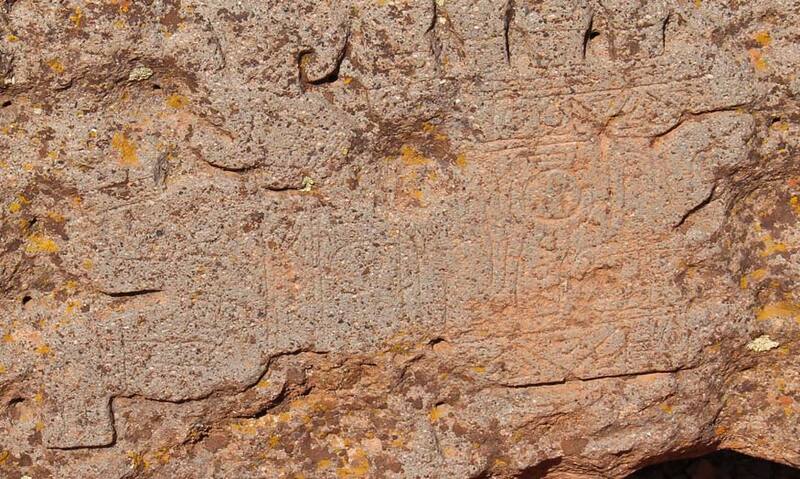 It seems to suggest the influence of a person or god who wasn’t from the area. 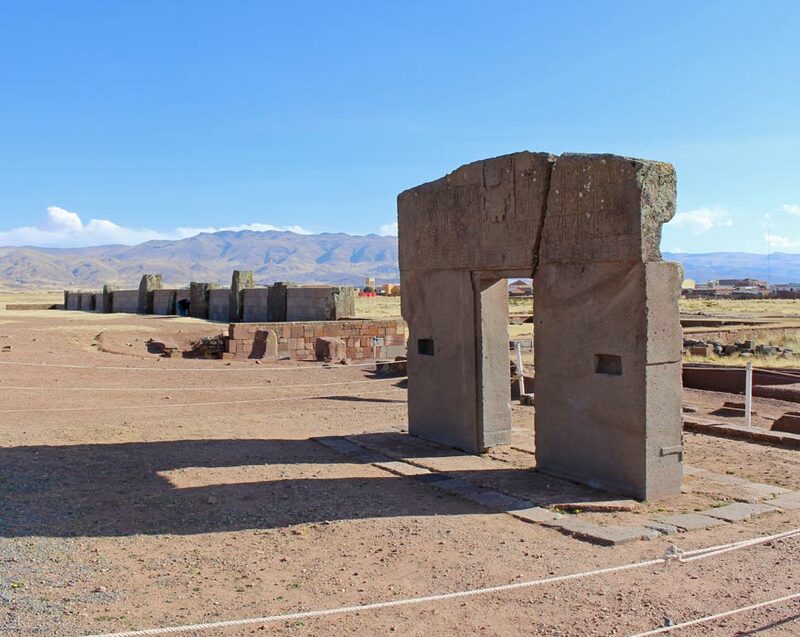 Also notable is the Gate of the Sun at Tiwanaku, a ten-foot tall gate constructed from a single piece of stone. 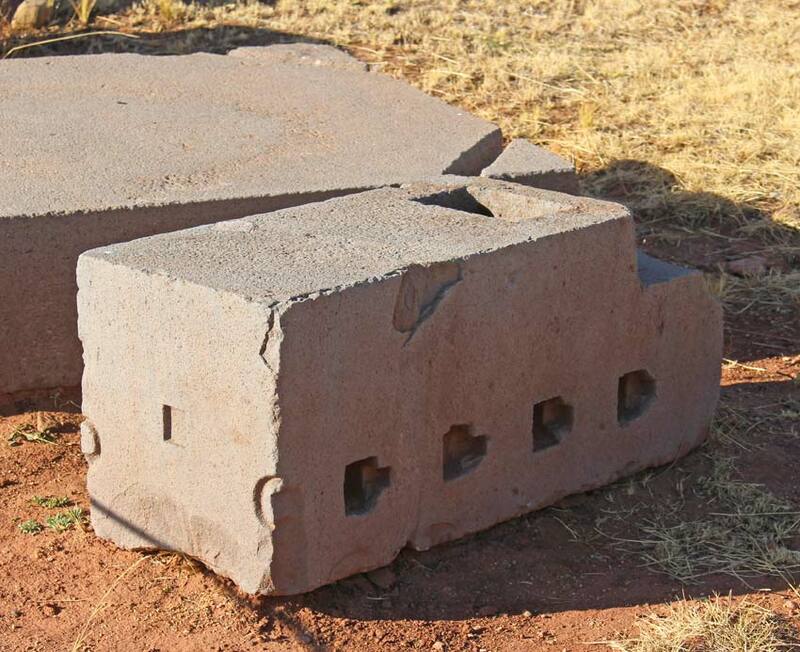 Explorers found it in the mid-1800s in its present location, where it had fallen and was cracked. 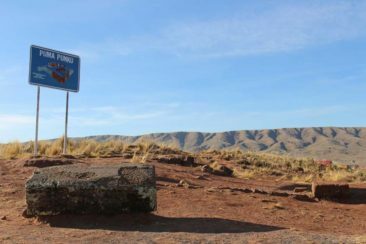 It was eventually righted and left where it was discovered, but most researchers don’t believe it is the gate’s original location. They don’t know from where it might have come, though some think it might have come from Puma Punku. 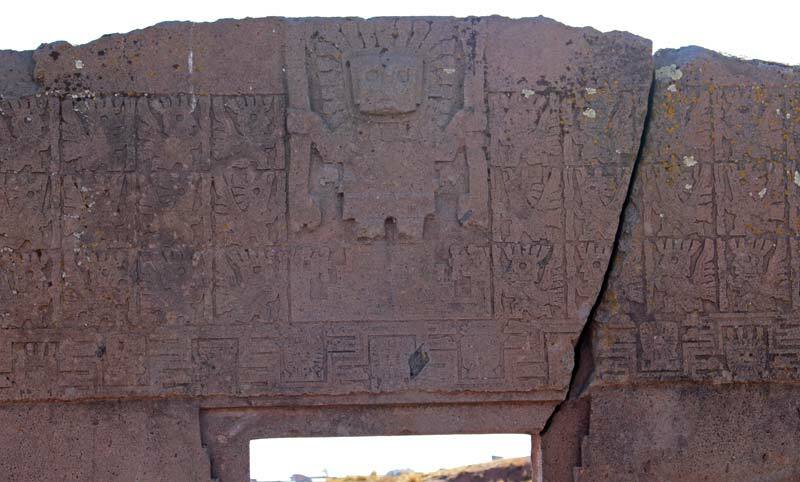 The Gate of the Sun likely had some astrological meaning or may have been related to the Incan calendar; it also features a carving of Viracocha at the center. We didn’t have a lot of time to study it, and with the sun setting quickly and casting dark shadows over the gate we were frustrated to not get some great pictures to remember it. 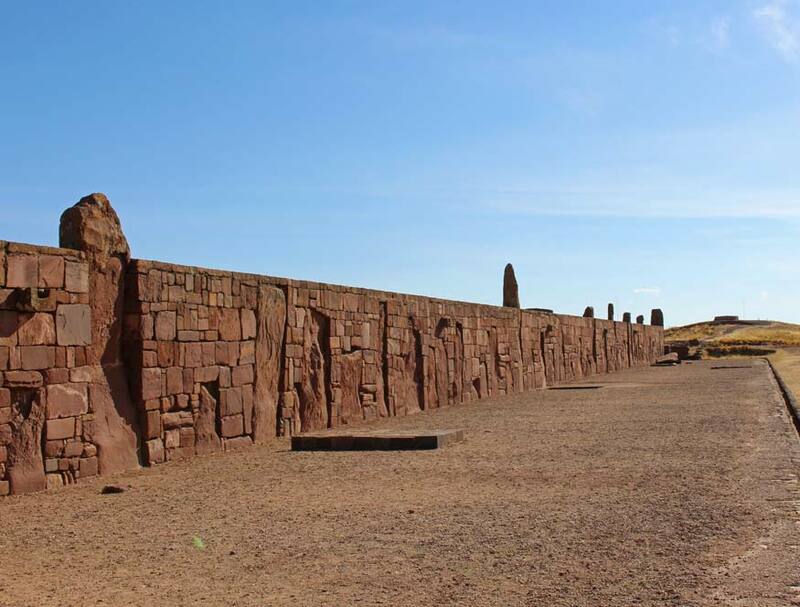 Our tour of Tiwanaku ended after 4:30 PM, which was a major problem for us because we still had not seen Puma Punku. Since it was just a quarter of a mile from Tiwanaku, our guide rushed us over (at our request) so we could spend 15 minutes at the site that led us to Bolivia in the first place. At the height of its existence, researchers believe Puma Punku was an incredible place filled with bright colors and frequented by a local population of around 400,000. 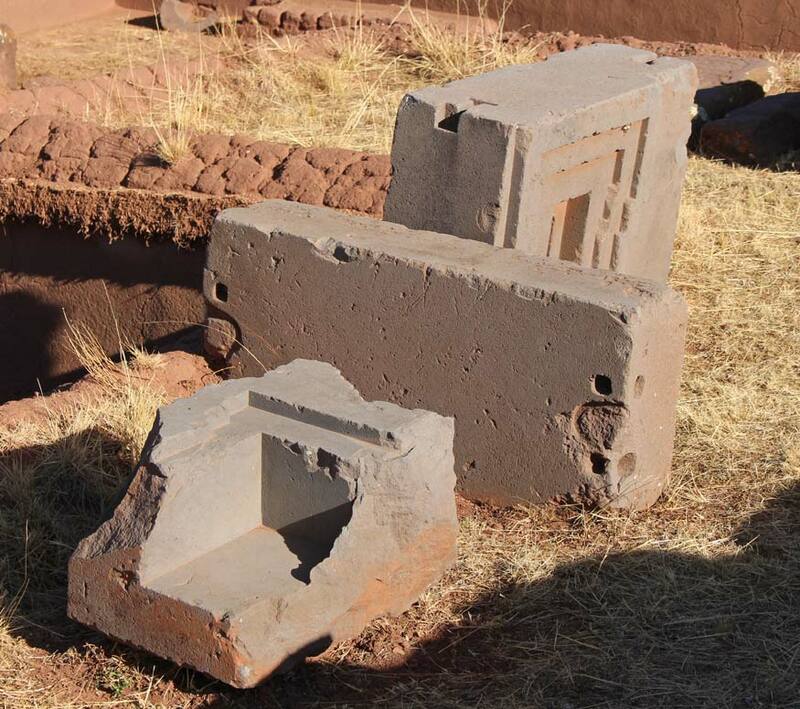 While many researchers think Puma Punku was abandoned before it was finished (possibly due to climate change that made it impossible to grow crops for the huge population that lived there), evidence of a pretty sophisticated infrastructure remains clear. Today, though, you would never guess that the area could have once been so majestic. With stones that are tipped over, almost looking like they were scattered across the horizon, it is clear the site succumbed to looting after it was abandoned. 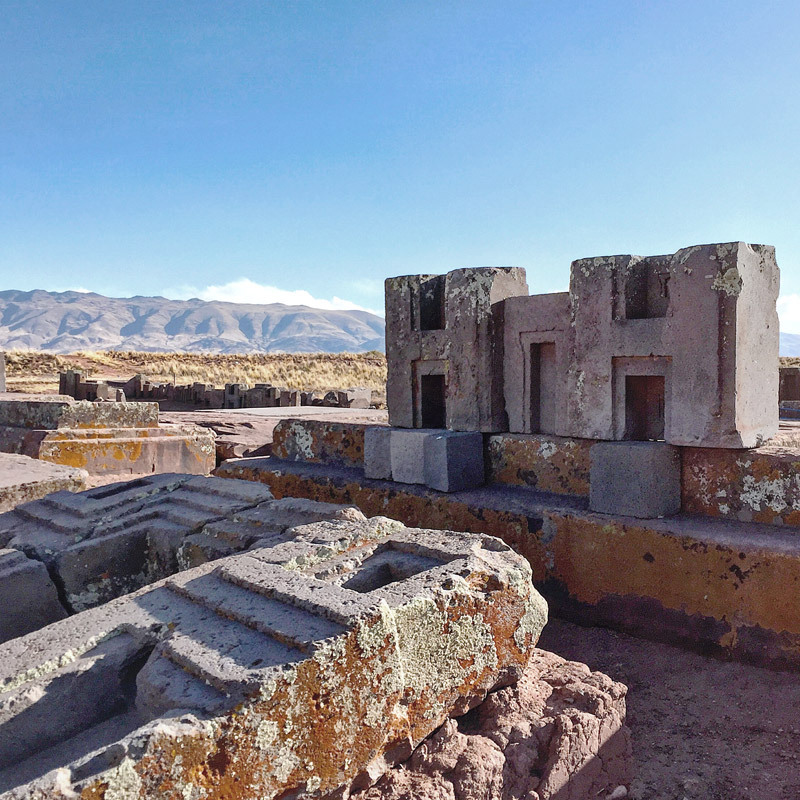 However, it’s easy to get wrapped up in the mystery that surrounds Puma Punku, even with a quick trip to explore. Immediately, we were both drawn to the famous H blocks. 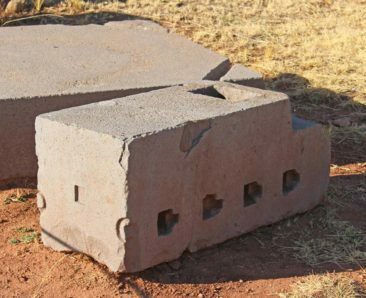 No one really knows why the H blocks were created, or why they made so many of them in one location. They are shockingly precise to the point where it is hard to understand how they could have been formed without modern technology. The exact 90-degree angles should have been impossible to achieve without advanced tools. 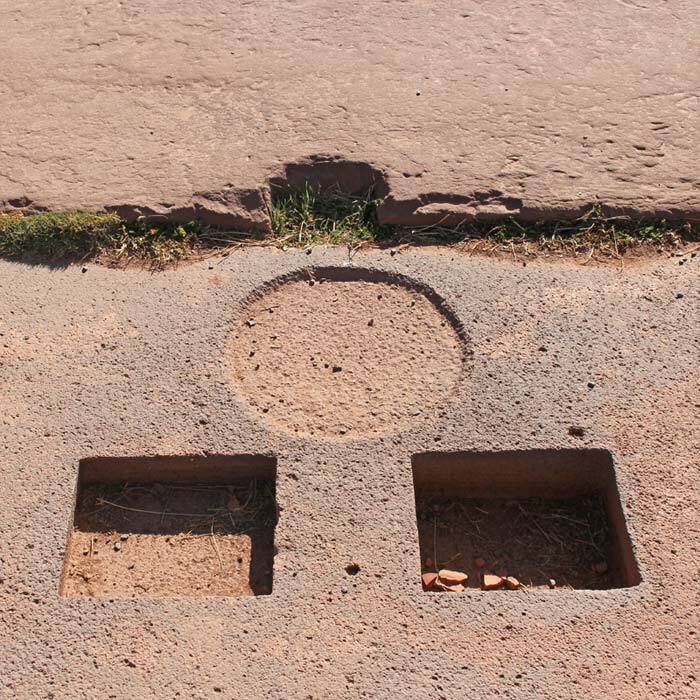 With no sign of any tools there is no real way to tell how they were shaped or how long it took to do so. 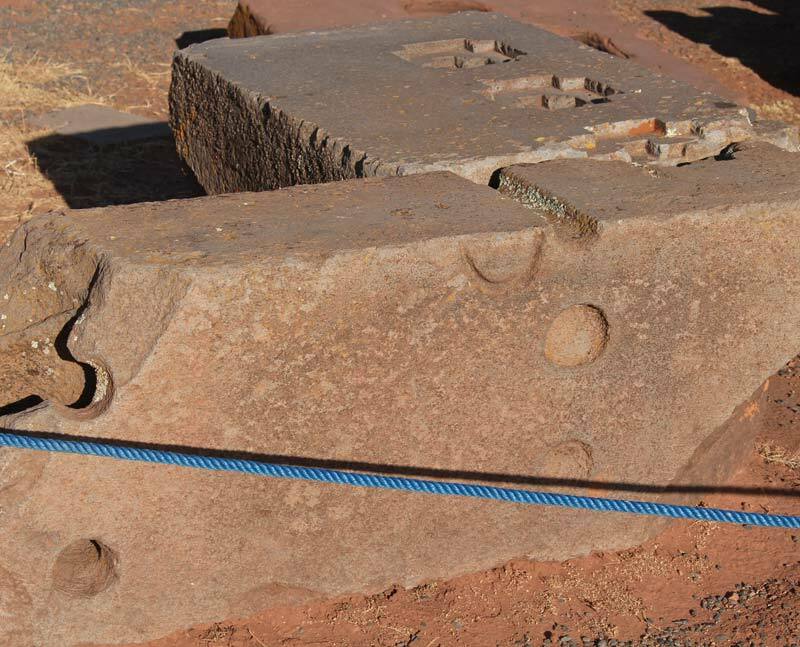 Beyond the H blocks stand large stones with complex, difficult drill holes. 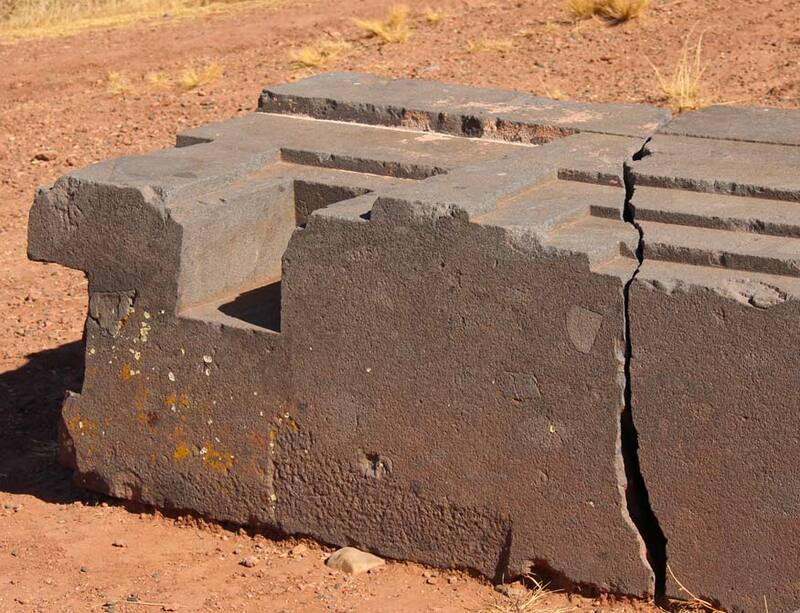 Again, there are no prevailing theories about why those stones were carved in such a way. Each stone is as smooth as glass, and running my hand over one of them felt like touching a granite countertop. I couldn’t imagine what steps were necessary to achieve that feat! 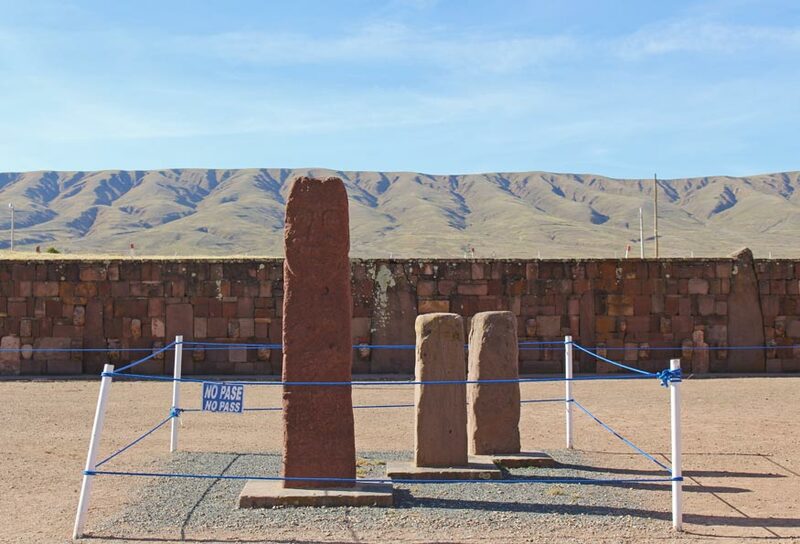 Much larger stones pepper the landscape as well, with some close to 25 feet tall and weighing more than 100 tons. Much like what we learned at Ollantaytambo, there is little to explain how anyone might have moved such incredibly large stones to Puma Punku. 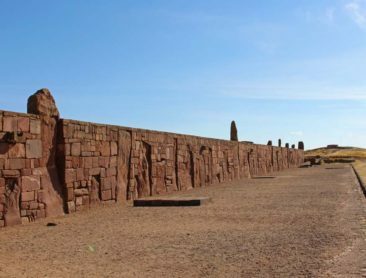 The entire area sits far above the natural tree line, which means using trees as rollers would have involved travelling hundreds of miles to bring them to Puma Punku. 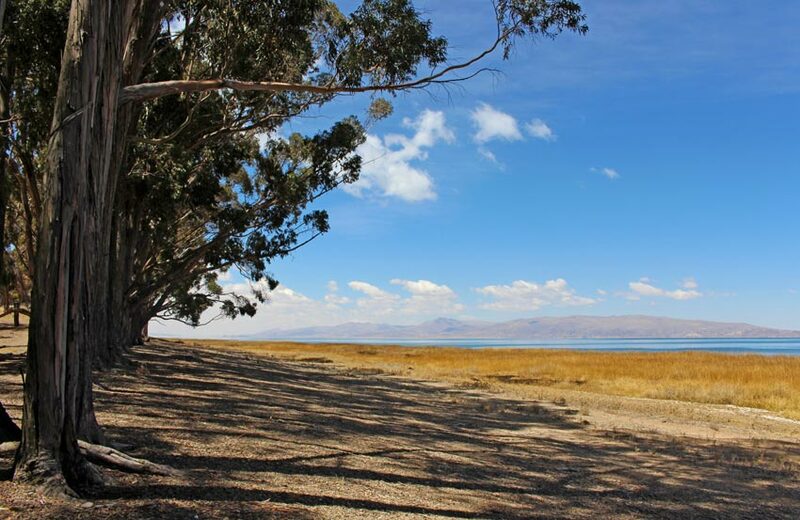 Currently, only eucalyptus trees grow at that altitude, and they were brought to the area in the 1800s. 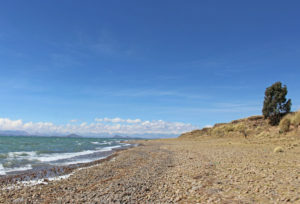 There is little evidence to suggest the stones could have been dragged from the quarries 60 miles away, either. 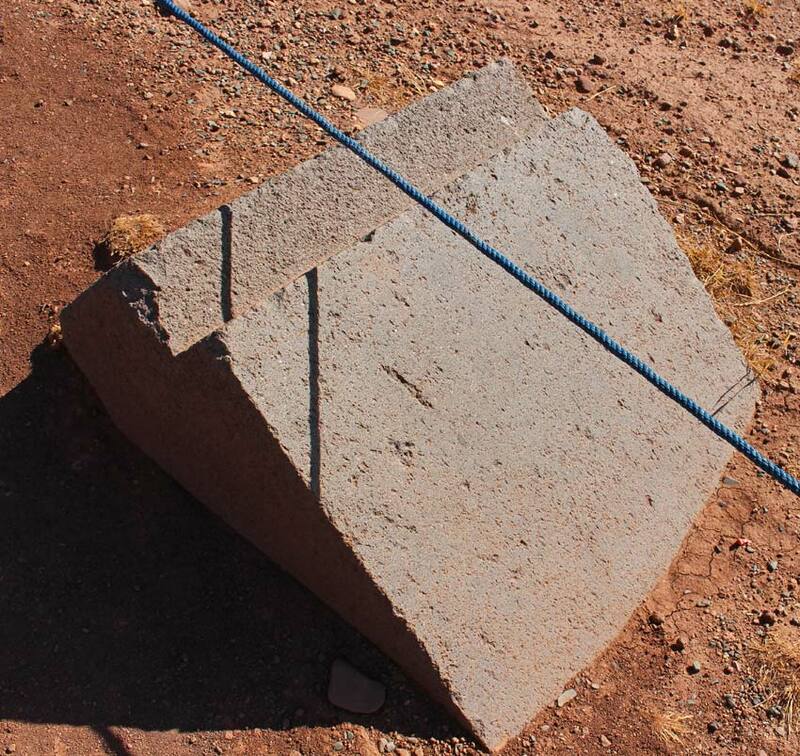 The stones don’t show any damage from the ropes they would have used—and there isn’t proof they would have had strong enough rope to drag the rocks anyway. 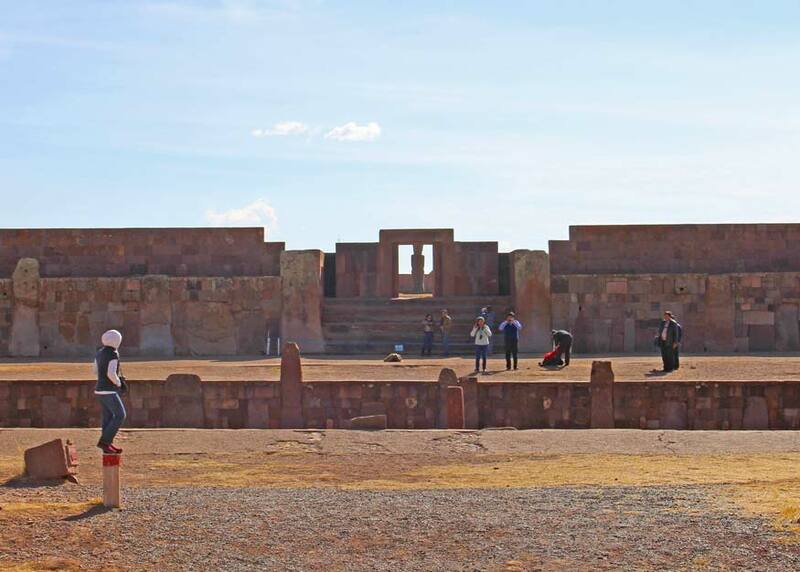 Due to some unfortunate time management from our tour, our time at Puma Punku was limited to just fifteen minutes, which simply wasn’t long enough to fully explore and take in a place so rich with history. We were disappointed when, right at 5 PM, the Puma Punku staff closed the gates and threatened to lock us inside if we didn’t leave immediately. We feel like we missed out on some of the experience we were looking forward to the most. 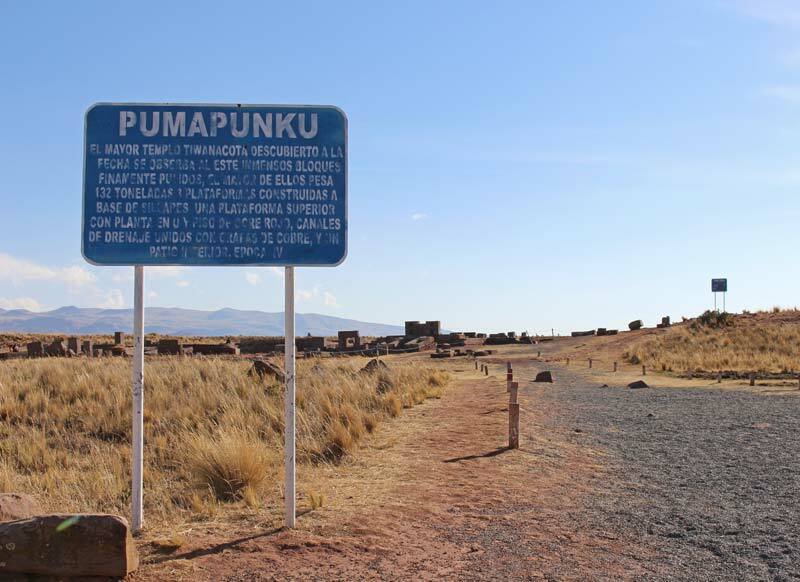 The tour spent too much time at Tiwanku and not enough time at Puma Punku. 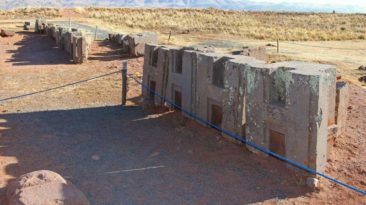 Additionally, we would not have been taken to Puma Punku at all had we not asked about it and requested to see it. 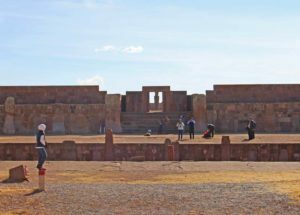 Had we been given the choice, we would gladly have traded in most of our time at Lake Titicaca if it meant we could spend more time exploring the incredible structures at Tiwanku and Puma Punku- not to mention the museum we had to skip. Although the lake was beautiful, it wasn’t a unique experience. 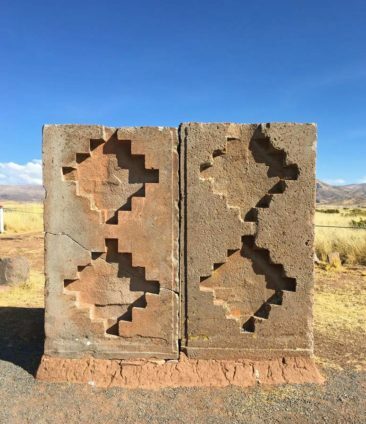 Tiwanaku and Puma Punku can’t be replicated. 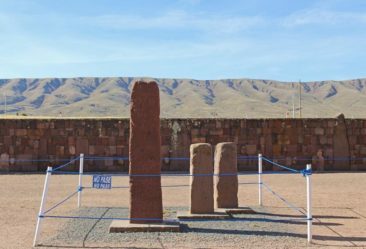 We’ve seen historical sites all over the world, but there is something about a place that just doesn’t offer answers about why it’s there that really draws you in. 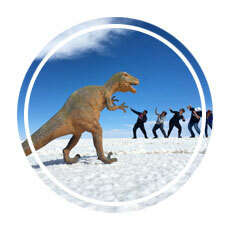 Of the time we spent in Bolivia, our day immersed in historical facts and total mystery was the most compelling. In a way, for me, the biggest mystery is why in the world so few people bother to visit it. 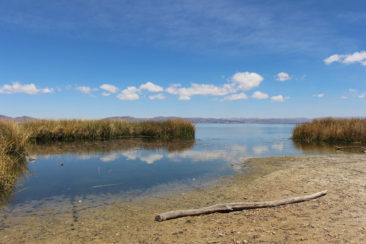 If your travels take you toward La Paz, don’t let this fascinating place fall off your radar. 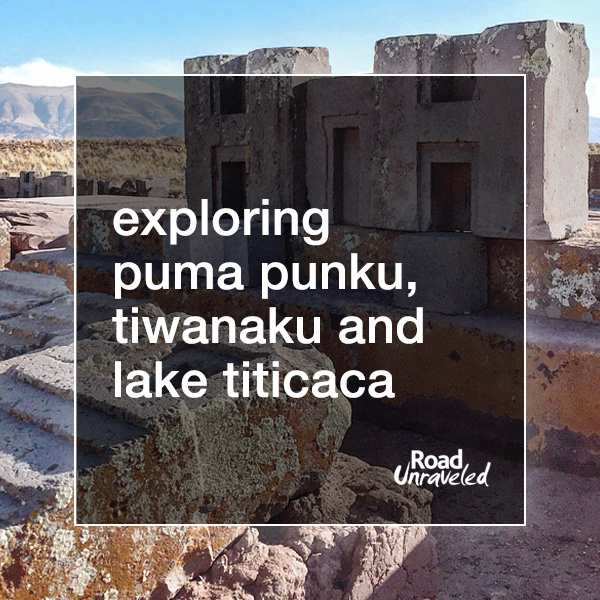 Lake Titicaca, Puma Punku, and Tiwanaku are geographically close to La Paz, but because of the poor infrastructure connecting the city to the ancient historical site we were a bit worried about getting stranded during our day trip. Road closures due to protests are very common, and the roads themselves are in terrible condition, which led us to wonder if we would get stuck on the side of the road with a flat tire. Our tour guide’s van wasn’t in great shape, either; the vehicle sputtered and stalled from time to time, and the windows in the back where we sat didn’t have UV protection, so Adam got a decent sunburn during the journey. 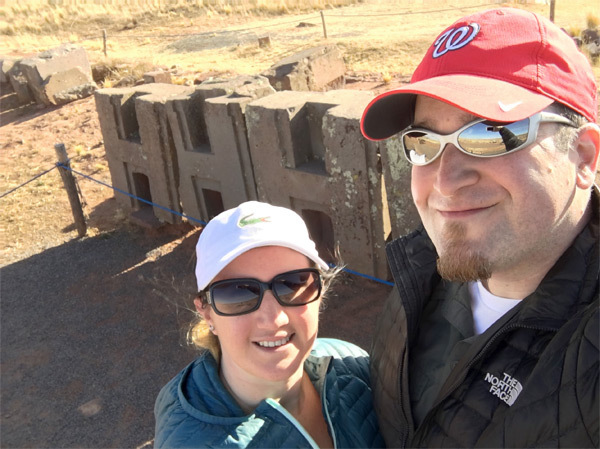 We were relieved to have travel insurance to protect us in case we ended up on the wrong side of a road closure, which in a worst-case scenario could have kept us from catching our flight home. 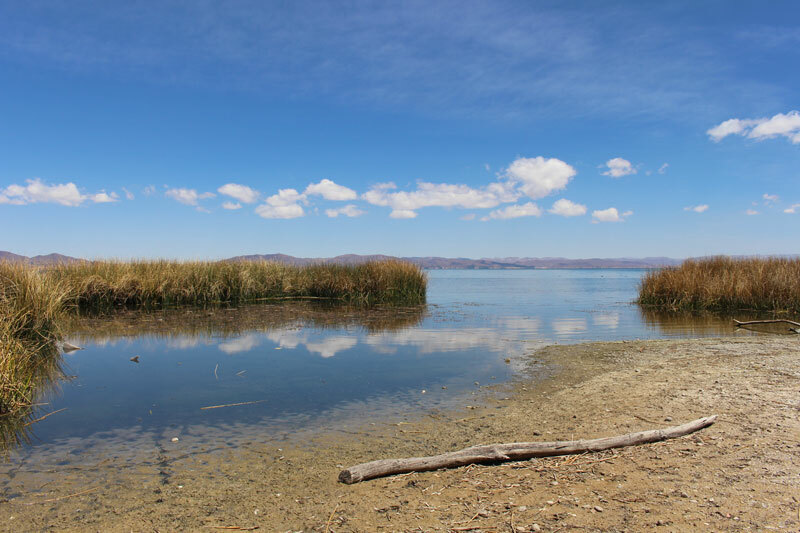 The policy we purchased from World Nomads put our mind at ease, and if you’re planning a trip to Bolivia it’s a good idea to research available plans and pick the one that’s right for you. Just because we didn’t have a lot of time doesn’t mean we didn’t take a lot of pictures! 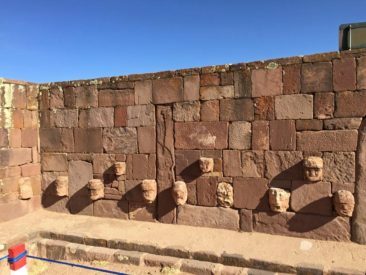 Here are a few more photos from Tiwanaku, Puma Punku, and Lake Titicaca. Ready to visit Bolivia? 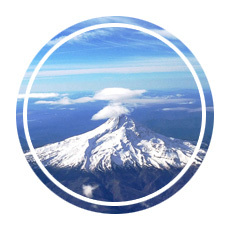 Here are a few more posts to help you plan your trip!